Phono Select’s Pick of the Month Fine Steps:Boys Co. The band Fine Steps was the birth of Sacramento native Julian Elorduy. Elorduy is no stranger to the music scene. Perhaps you have heard of a little band called Mayyors? Stepping out from behind the drums and far from his punk rock roots, something magical has happened. With the help of Antonio Gualco, Alex Sowles, Dylan Craver and Kyle Hoover, Fine Steps pressed and released Boys Co. This record is far from a disappointment. 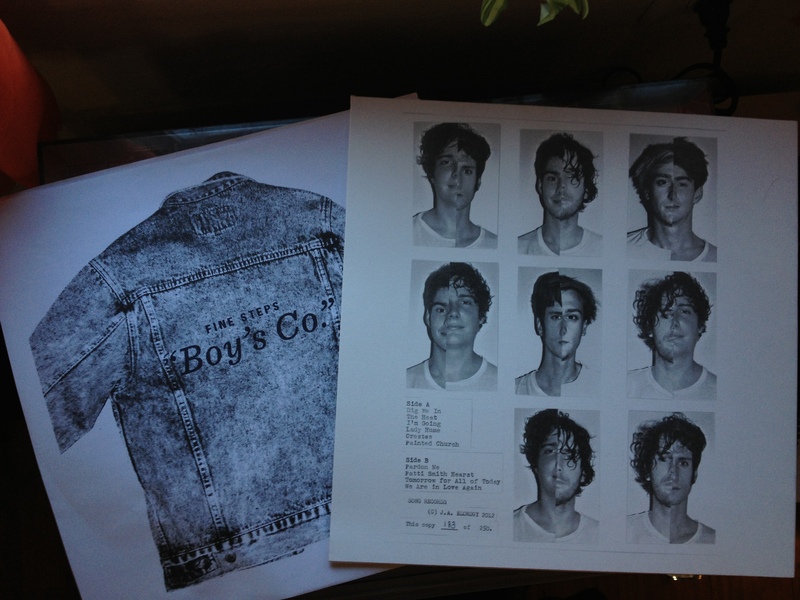 Boys Co. was released in early 2012 however you cannot really put your finger on the exact era that you are thrown into upon listening. While a vision of hips swinging in shift dresses and cocktail parties float through your mind, there is something incredibly fresh about this album. Side A starts first with a stark silence and then the lonely echo of la, la, la la la la la… which leads into an immediate dance of a timeless album. Dig Me In is the flawless beginning to an album full of jangley guitars and immaculately placed harmonies. Elorduy’s voice is a slow but strong rumble among the mix of steady dance songs. Lady Hume is a fantastic example of a roughed up love song. It is sweet and honest with lyrics tossed in such as, “For you I take the pain, to save you your shame”. The steady guitar progression and familiar bass line gives the song an immediate feeling of comfort. With light and airy guitar picking sprinkled throughout to balance the gritty prominent rhythm guitar. Patty Smith Hearst is another favorite. Guitars build on a slow bass line aligned with Elorduys voice. Floating throughout the dark song is a complete contradiction chanting “be happy, be happy, be happy.” With lyrics such as “tell everyone, I am free and strong” next to notes absorbed with such a rainy day approach it seems Elorduy is trying to convince himself into an uplifting song. Tomorrow brings Boys Co. nearly to a close, with surf beats and happy guitars. It is the sunniest song on the album and a great transition from Patty Smith Hearst. It is impossible not to smile while you are swept away by an incredible build up of uplifting notes and high-spirited lyrics. Everything is placed together so perfectly that the album is a story that comes full circle. Each song relates to the next in a handsome garage rock sort of way. The band obviously knows it’s music history and is not afraid to relate to what they love while still adding their own spin and taste. If Interpol, Pavement and The Ventures had a baby, it would be this album. Tags: album, album reviews, Alex Sowles, Antonio Gualco, boys co., Dig Me In, Dylan Craver, Fine Steps, Fine Steps Boys Co., Julian Elorduy, Kyle Hoover, Lady Hume, Patty Smith Hearst, phono select, phono select pick of the month, phono select records, phonoselect, record, record review. Bookmark the permalink.